London, March 21: British Prime Minister Theresa May has told the public she is "on their side", laying the blame for the delay to Brexit squarely with MPs. 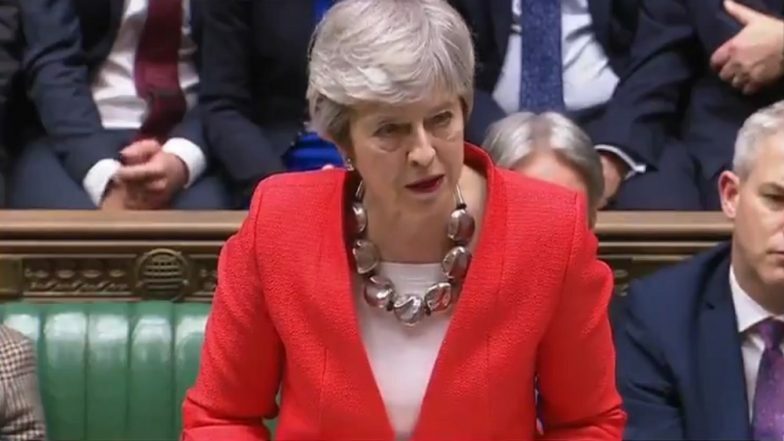 Speaking from Downing Street, May said people were "tired of infighting and political games" and it was "high time" politicians made a decision on the next steps, the BBC reported on Wednesday. Earlier, May wrote to EU Council President Donald Tusk requesting to delay Brexit until June 30. She said the postponement was a "matter of great personal regret". The Prime Minister reiterated she would not be willing to extend Brexit any further than that date -- despite appeals from some MPs for a longer extension to give time for a change in direction. The UK is set to leave the EU next Friday, on March 29, unless the law is changed. Theresa May's Brexit Deal Gets Voted Down in Parliament Putting March 29 Brexit in Doubt. All other 27 EU members would have to agree any extension beyond that date. Tusk said he believed the EU would agree to a short extension, but only if the withdrawal deal negotiated by Theresa May is signed off by MPs next week. It has already been overwhelmingly rejected twice. In her statement, May said: "Of this I am absolutely sure. You the public have had enough. "You are tired of the infighting, tired of the political games and the arcane procedural rows, tired of MPs talking about nothing else but Brexit when you have real concerns about our children's schools, our National Health Service, knife crime. "You want this stage of the Brexit process to be over and done with. I agree. I am on your side." She said it was "now time for MPs to decide" whether they wanted to leave with her deal, no deal or whether they chose not to leave at all - the latter she warned could cause "irreparable damage to public trust" in politicians. "So far Parliament has done everything possible to avoid making a choice," said May. "Motion after motion and amendment after amendment has been tabled without Parliament ever deciding what it wants. All MPs have been willing to say is what they do not want." She made a final appeal to MPs to back her deal and told the public: "You just want us to get on with it and that is what I am determined to do."